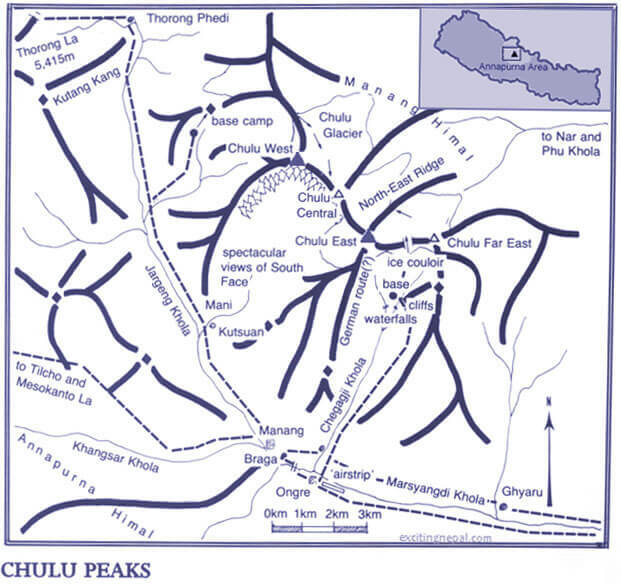 Chulu East Peak forms an integral part of Manang Himal combining with Chulu West Peaks, which ultimately combined with Damodar Himal. 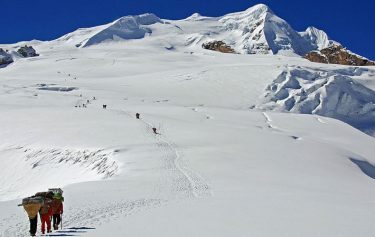 Chulu East Peak is bounded by the Marsyangdi River and the Mesokanta La to the south, Kali Gandaki to the west and Parchekya La (5,447m) to the north. 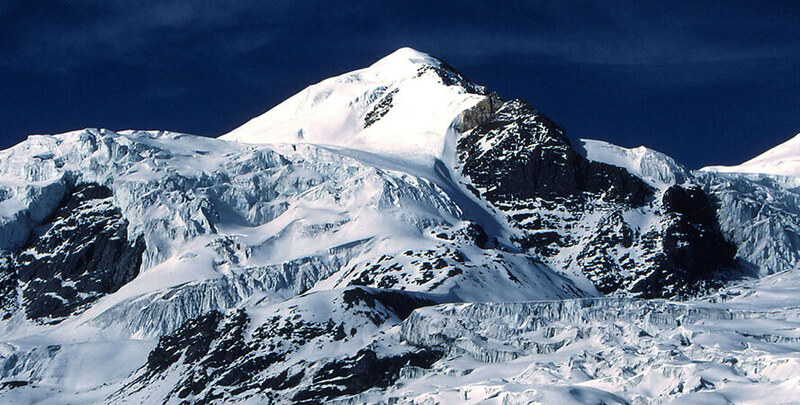 Chulu East Peak which stands at the elevation of 6,584m is relatively a smaller climbing peak that lies south east of Chulu West. 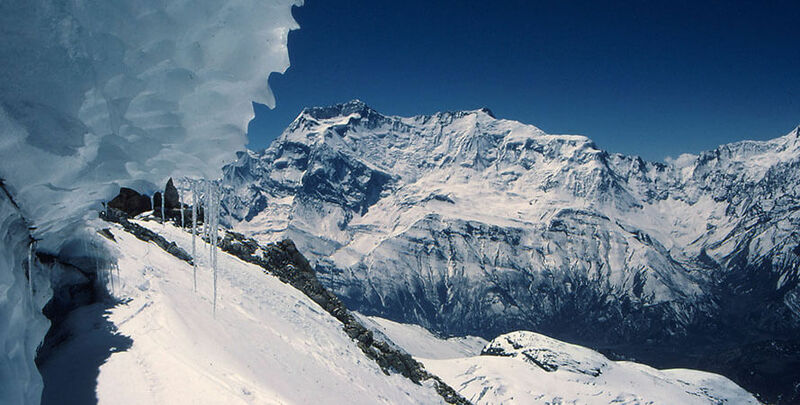 The Chulu East Peak offers amazing scenery of different mountains of Nepal Annapurna Range, Dhaulagiri, Tilicho, Mt. Manaslu and many more. 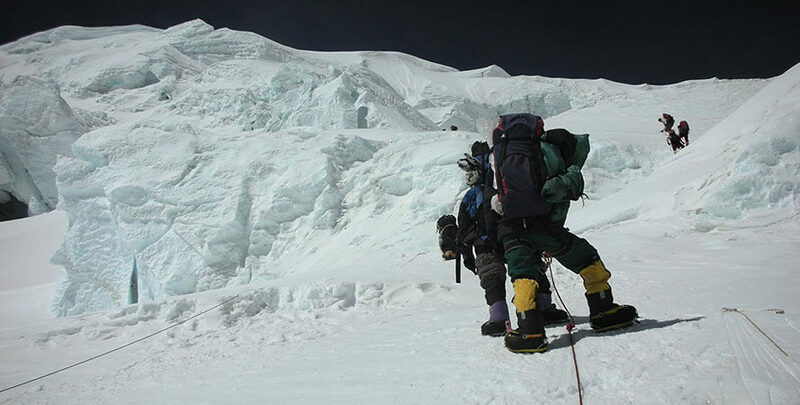 Chulu East climbing is technically difficult for the new climbers. 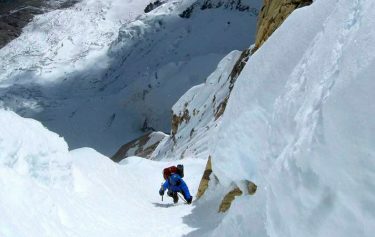 Hence, the climbers must be familiar with the use of climbing equipment like crampons, ice axe, climbing ropes and tying knots. 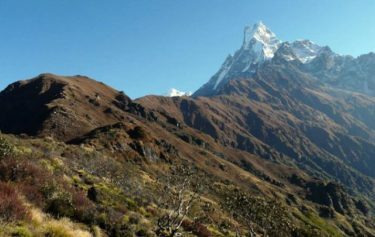 We begin our climbing tour to Chulu East Peak from Kathmandu to Besisahar and trek the common trial that leads to Annapurna Circuit Trek and reach Chulu East Peak within a week. The diversity of greenery along the trail of this Annapurna Region until arriving at the Chulu East Peak are unimaginable. 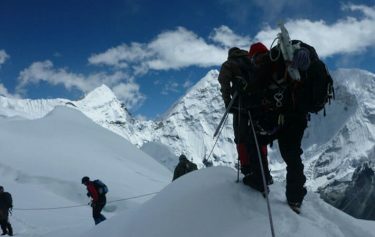 Along the way we plan to climb moderate snow and ice over 6000m along with Chulu Peak. After successfully ascending the Chulu peak we make our way to Throng La Pass at an elevation of 5000m; then the trail follows down to the spectacular pilgrimage site, Muktinath. The following day we begin our downward trek to Jomsom for the interpid 20 minutes flight back to Pokhara. We offers full board bundle for this Chulu East Peak moving as an exceptional exploit incorporating climbing permit from NMA and all other essential logistics. 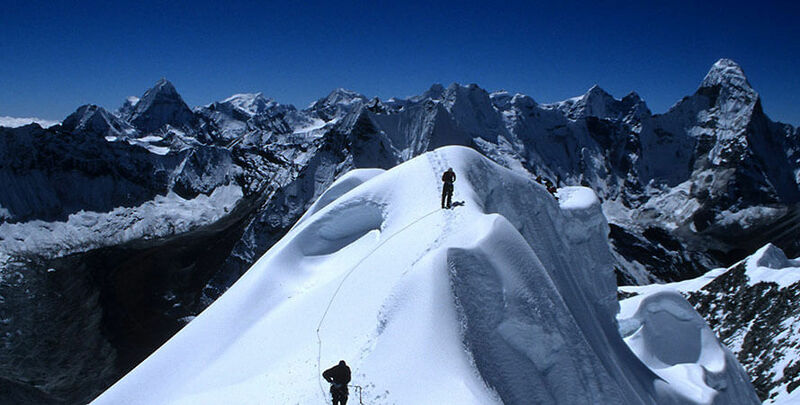 Our administration includes the best maps of climbing route, hygienic food prepared by our experienced cooks, experienced and expert climbing guides, well managed settlement and sage tours to Kathmandu and Pokhara Valley. 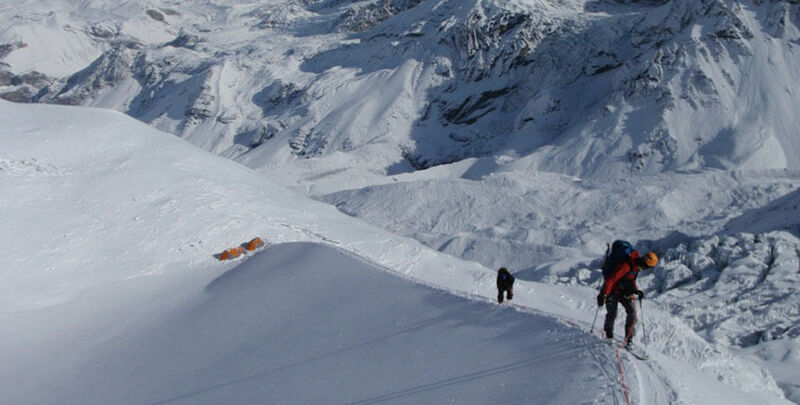 A climb of Peaks like Chulu East and Chulu West combined with Annapurna Circuit trek around the Annapurna region make up for one of the most spectacular Himalayan trekking and climbing. The eastern limit of which runs south from Chako and Peak 6687 in a north-to-south direction along the Hunlung Khola, Nar Khola and Phu Khola. The south it is bounded by the Marsyangdi River and the Mesokanta La. To the west its limit is the Kali Gandaki and to the north the Parchekya La (5,447m). Trail along the canal on the outskirts of the village before descending the narrow path to the Pam Khola. After crossing the stream, we ascend towards the village of Denauti, which will be your first experience with authentic Nepali villag. The route continues along the banks of the Marshyangdi Khola, passing through paddy fields and subtropical forests. Continue through the Marsyangdi Valley, we get our first views of the magnificent Annapurna mountain ranges. breathtaking view of Manaslu and picturesque cascading waterfalls. Trail continues uphill, we pass Ngadi village. Before passing through the challenging trails to Bahundanda. Through the rice fields, before crossing a stream at the bottom of a small waterfall. It then rises again and traverses the hillside high above the river before reaching the village of Hani Gaon. Ahead, the Marshyangdi valley forms a steep V-shape. We follow the winding mountain path through Syange along a relaxing river. The trail from Jagat descends until it reaches the river and then continues through a charmingly lush forest. Further ascent leads to sharp-edged cliff facing the riverbank. Along the way Chyamje comes into vies amidst the towering Annapurna mountain ranges. After crossing a suspension bridge, we continue our climb towards the challenging path to Sattale. After treading along a succession of rock-laden trails, we descend to a grassy riverbank passing through Tal as the trail becomes increasing difficult and narrow. From Chame to altitudes over 3000 meters. You will notice the surrounding changing as natural trees and plants become more scarce as the terrain begins to shift to a drier more desert like environment. Continue the mail trail leading to the Chegaji Khola Valley on the way to the Chulu East Base Camp. We will continue uphill through a juniper and pine forest before reaching the area known as Julu. Acclimation day where you are free to relax with the locals or take a few short hikes to admire the local scenery and learn more about the lifestyle, economy, culture etc of the local people. After enjoying a refreshing morning sunrise view, we continue along the winding trail before the meadow meets a large rock formation. 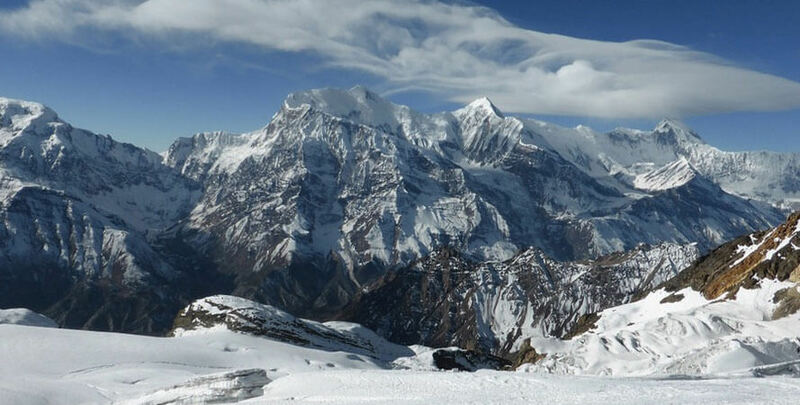 We will camp near a stunning viewpoint offering views of the Annapurna giants towering over the clouds. Today we take a full day rest to adjust to high altitude. You have a free day to relax, chat with locals, prepare your equipment for the following day or take a few short hikes to enjoy the local scenery. After packing and arranging our equipment, we move along the trail admiring the rapidly changing landscape as we reach higher elevations. We then continue along a steep trail leading to the strategic high camp location that will allow the best access to the peak. We will set up camp here and enjoy a timeless panoramic sunset as the mountains reflect the pinkish sunlight over the mountains. 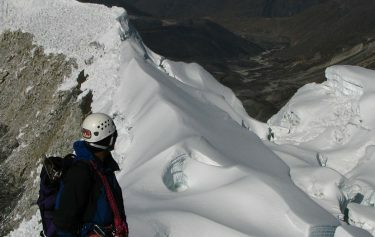 The climb will take a full 2 days and we begin climbing along the glacier through slippery ice trails. We will stop at several breathtaking vantage points before reaching a glacier composed of stone steps leading the way to the top. We then continue the journey to the peak of Chulu East stopping to admire the panoramic scenery and celebrate the highlight of our trek. We then return back to high base camp for some much needed rest. We will take a hike along the glacier to reach the other side of Chulu East to ensure we have taken all the best views in the region. After stopping at the various vantage points and having lunch we will return to high base camp for the night. We will take a light day and return back down to the base camp taking plenty of time to descend safely on the slippery trail. Upon arrival at the base camp you may either rest or take a short hike to enjoy more of the local scenery. We will return to the orginal path leading to Manang passing through several agricultural fields taking time to stop at the Bryaga Monastery to see the daily routines of the local monks. The monastery is famous for its timeless views of the Annapurna region and we will stop to enjoy the spiritual mountain scene. 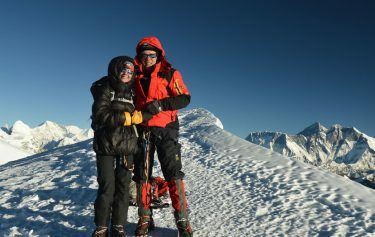 We have an early start today for the crossing of Thorung La [5416m]. The trail becomes steep immediately on leaving camp, the path is well defined. The gradient flattens after around 4 hours of steady climbing, From the snow-covered mountains above, to the head of the Kali Gandaki valley below we are surrounded by the brown and purple hills of Mustang offering a once in a lifetime vantage point But the excellent views of Dhaulagiri, more then makes up for the tiring journey. We will head down the Kali Gandaki Gorge past the town of Kagbeni before arriving in Jomson. We will stay here for the night to learn more about the local culture and customs of the Tibetan people while exploring the peaceful town. We will return along the short 35-minute flight route to Pokhara.